On February 8th, we were joined by 140 wonderful Foster Village supporters for our inaugural 'Gala With a Twist'. 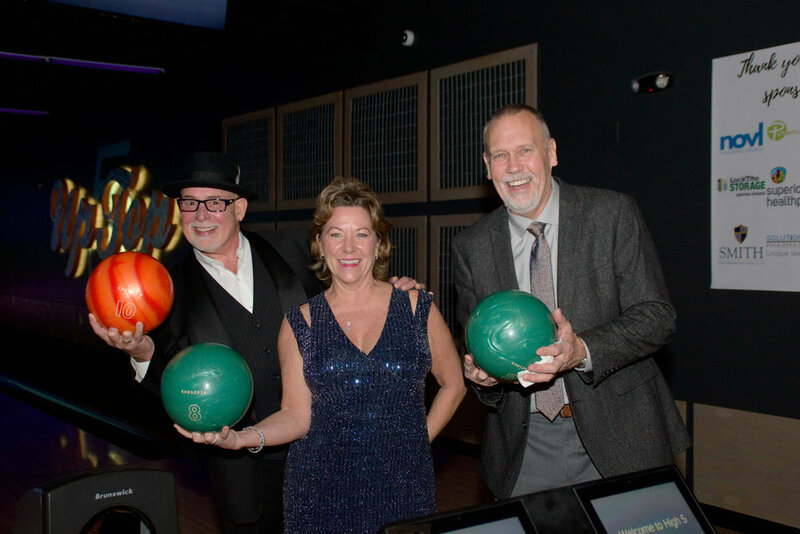 The event was hosted at High 5 in Lakeway and our theme was Black-Tie Bowling. We managed to merge the importance of sharing our mission while incorporating a child-like twist on the traditional gala. Thanks to the generosity of the guests, sponsors, silent auction donors, volunteers, and cheerleaders who faithfully rallied this village of support for our most vulnerable neighbors, we raised over $30,000! Special guests and Foster Village Founding Partners included NFL player Phil Dawson and former NFL player and UT coach, Michael Huff. Phil's wife, Shannon, shared her story as an adoptee and child welfare advocate in a moving call-to-action speech during dinner. Nick and Chrystal Smith, Foster Village founders, shared highlights and stories of some of the 700+ children that Foster Village supported in 2017 as well as the organization's goals moving forward. We also had an impactful on-the-spot testimonial shared by an inspiring foster mom of 7 children who has been personally supported by the work of Foster Village. We are so grateful for our community partners and guests for making this event a success and we are already looking forward to doing it again next year! Sponsors included Novl, Austin Ridge Bible Church, Solutions Pharmacy, Stone House Ranch, Superior Health Plan, Andrea Parker with Keller Williams, Moody Orthodontics, Smith Wealth Management Group TX, and Putonti Law Firm. In addition, there were many local silent auction donors including: Wanderin' Star Farms, Treaty Oak, Liney Moon, Your Biker Gang, Todd Whipple, Verdes, Zip Lost Pine, Stanley's Farmhouse Pizza, Vintage Soul, Walt Smith for County Commissioner, LockTite Storage, Carol Mogen, Cat Miller, the Piazza Center, Hat Creek Burger, Urban Mattress, Waller Creek Pub, Yonder Way Farm, Jessica Putonti, Fairmont Hotel, Fixe Austin, Kendra Scott, and High Five Events Center. Thank you to everyone who joined us! !